Nélisse) and Victoria (Megan Charpentier) in "Mama"
Jessica Chastain shines in this contemporary classic ghost story as a reluctant stand-in mother who has a violently possessive rival from the afterlife. The charm of this family-in-peril piece is its elegant simplicity, with a small cast that plays things completely straight. Beautifully shot by Antonio Riestra, and with a lush Fernando Velázquez score that evokes screams one minute and tears the next, "Mama" is an early contender as one of the best horror movies of the year. 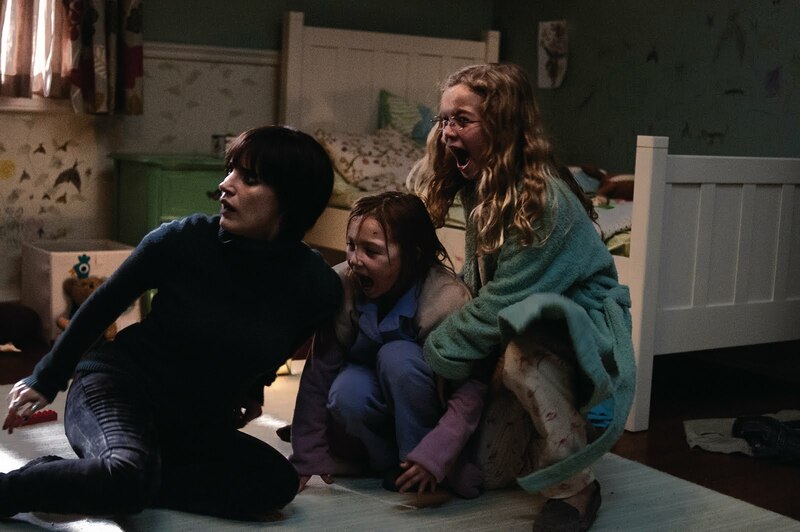 In the film's frantic opening, five-year-old Victoria and her younger sister Lilly are abducted by their businessman father, who has killed their mother and a couple of coworkers. Deranged dad is oblivious to the danger as his car speeds and skids sideways on icy mountain roads. Morgan McGarry is heartbreaking in a tiny role as the bespectacled young Victoria. She is more confused and sad than Hollywood hysterical when she tells her father he's "going too fast" just before their car plunges over the mountainside, or when she quietly notes later that "my glasses are broken." Five years later, uncle Lucas ("Game of Thrones"'s Nikolaj Coster-Waldau, who also plays the father) still has not given up hope of finding the girls and his brother. A search party locates a cabin where the girls have survived as filthy and feral creatures, now skittering around on all fours. A shadowy and twisted supernatural spirit they call Mama, unseen by the adults, apparently has kept the two alive. When Lucas and girlfriend Annabel (Chastain) get custody of the girls, Mama pays secret visits to their home that progress from creepy to life-threatening. Chastain is excellent (and nearly unrecognizable) as Annabel, a tattooed bass player with raccoon eyes, lots of cleavage and a Joan Jett-black hairdo. First seen expressing relief that a home pregnancy test is negative, Annabel clearly has no interest in motherhood. She's also less than thrilled with the idea of moving to a house in the suburbs to raise her instant family. Chastain's performance here is unexpectedly more interesting than her Oscar-nominated work in "Zero Dark Thirty," if only because in-over-her-head Annabel seems more convincingly human than workaholic CIA agent Maya. The actresses who play the older versions of the two girls are good at making them seem damaged but not ridiculously demented. Lilly (Isabelle Nélisse) remains more animal than human, but deadpan Victoria (Megan Charpentier) believably begins to realize that Mama may not have their best interests at heart. The movie's chills are mostly of the there's-something-behind-you variety, with Mama occasionally jumping in (or into) someone's face. 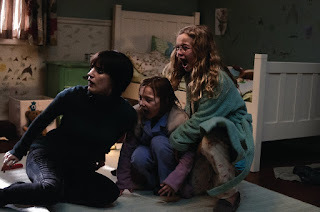 Andy Muschietti, who cowrote the screenplay with sister Barbara Muschietti and Neil Cross, directs this classy creepfest (based on the Muschietti's 2008 short film "Mamá") with an assurance that makes it hard to believe this is his feature debut. The only cast member who comes off like a stock character is Dr. Dreyfuss (Daniel Kash), a sneaky psychiatrist more interested in using the girls' stories about Mama to make a name for himself than in keeping them safe from harm. A couple of plot stumbles include Dreyfuss taking a nighttime trip to Mama's old haunt, and a busybody aunt doing some very unlikely breaking and entering at the girls' new home. Making up for those flaws are some impressively stylish flashback sequences showing Mama's unsettling origin, and an unexpected climax that's both terrifying and tearjerking. Executive produced by Guillermo del Toro, whose 2006 "Pan's Labyrinth" set the standard for grim girl-in-trouble fairy tales, "Mama" manages to be both spooky and surprisingly poignant.